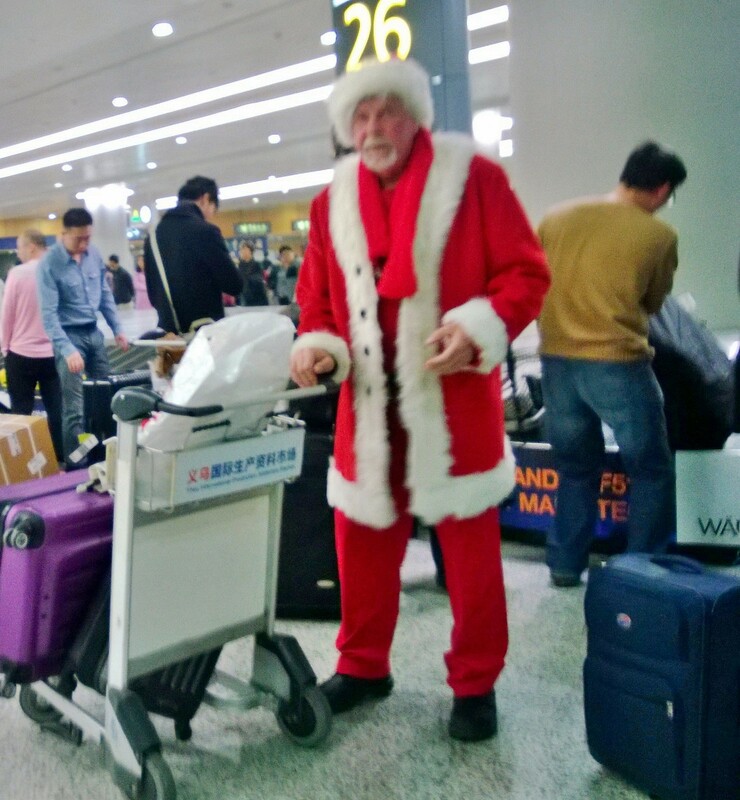 Santa has left the North Pole and landed in Shanghai—who knew??? 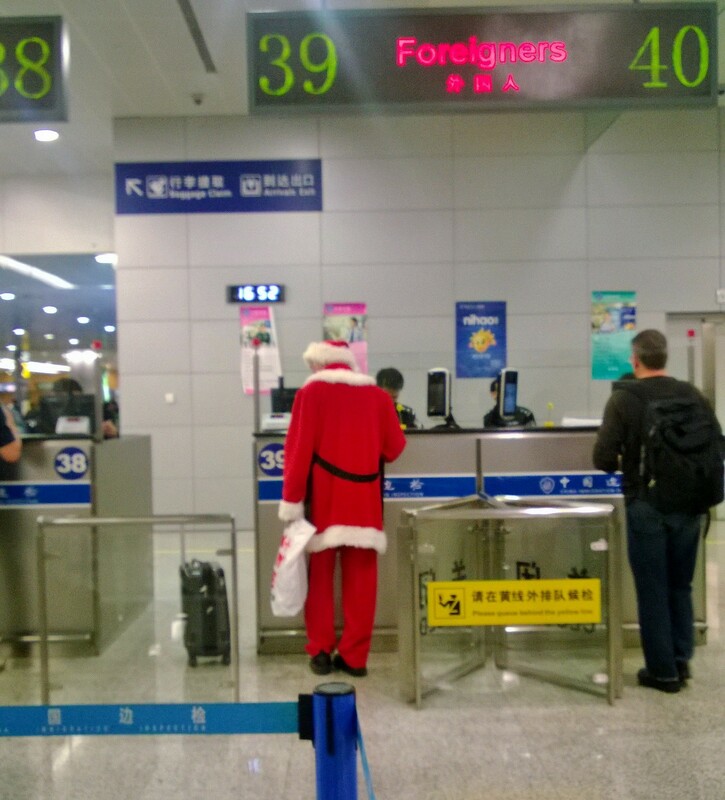 Going through Customs as a “Foreigner”, Santa was decked out in full-on “ready for the sleigh” uniform, pausing only briefly to gather his personal belongings with us mere mortals at baggage carousel #26 before heading out to take care of the holiday needs of all the good little boys & girls in China. Hope he ate his Wheaties cause there are LOTS of folks needing some holiday magic here! Embracing the holiday spirit despite warm weather and crushing pollution, many retail establishments have hung their Christmas stockings with care. Decorated trees and Santa images abound in almost every venue. Bing Crosby croons on the Muzak. We decided on an artificial tree because we are unsure of the true “freshness” of the $200 US trees that are sold here, primarily for the expat demographic. We envisioned a pile of pine needles greeting us upon our return home one day so are playing it safe with fake. The China versions of Christmas trees come in many different colors-gold and red are popular “lucky” colors here….buying a boring green one just doesn’t seem local. At Boxing Cat Brewery, they are even embracing one of the more crazy traditions from the U.S. by having an Ugly Sweater Christmas Party with Santa & his elves hosting with “free flow” drinks—I’m guessing Santa will probably be very merry at this party on Christmas Eve so the sleigh may be weaving a little on the way back to the North Pole. 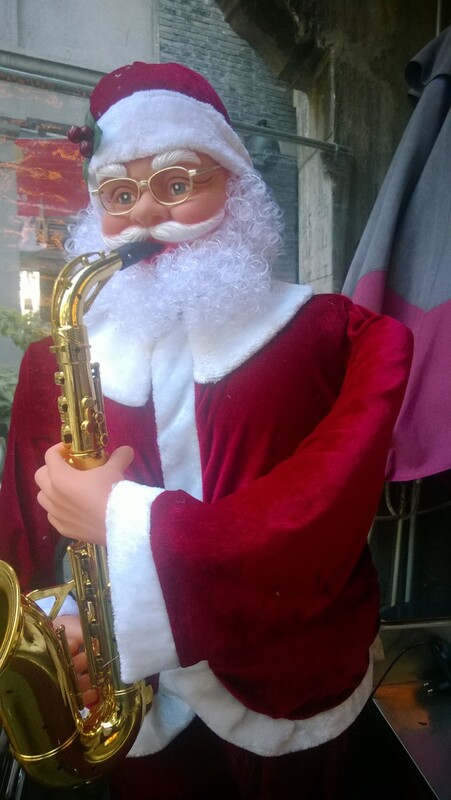 Ho, Ho, Ho! Rudolph with your nose so bright, let’s try to fly through that funny hole in the Financial Center tonight! 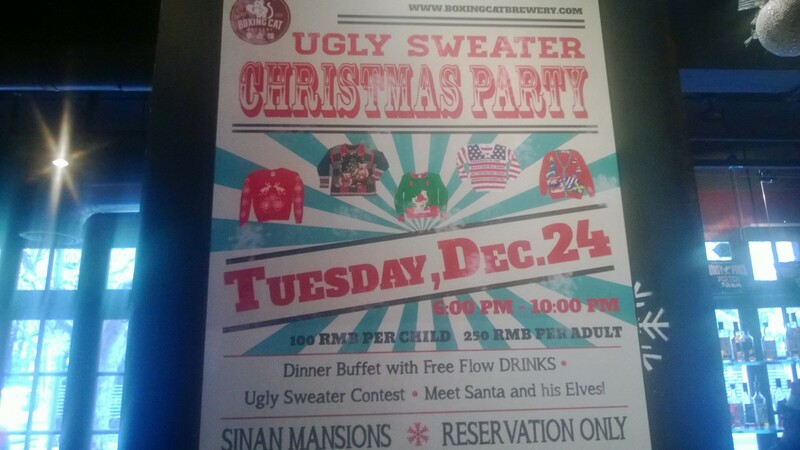 At only 250 RMB per adult, the Ugly Sweater Party is one of the cheaper ways to celebrate Christmas Eve here in Shanghai. Shanghai likes to eat and the holidays provide a great opportunity to put on lavish spreads. I’ve never seen so many Christmas dinner offers by all the restaurants in town—running anywhere from 300-1200RMB and more for a multi-course meal. Not sure what we’ll be doing on Christmas this year but it’s guaranteed to be an adventure and a new experience..Santa, Shanghai Style!